1792 ~ 1795: born in Kamigata. He was the fourth son of the stage giant Arashi Koroku III. His first stage name was Kanô Yasojirô. 29th day of the 3rd lunar month of 1796 : his father Arashi Koroku III died. 4th day of the 2nd lunar month of 1801 : his elder brother Arashi Hinasuke II died in Edo. 17th of the 9th lunar month of 1813 : his elder brother Arashi Hinasuke III died. 11th lunar month of 1817: Kanô Minshi I and Kanô Yasojirô respectively took the names of Arashi Koroku IV and Kanô Minshi II at the Naka no Shibai, performing together in the drama "Echizen Sangoku Meoto-zuka". 15th day of the 11th lunar month of 1826 : his elder brother Arashi Koroku IV died. 9th lunar month of 1831: Minshi went to Edo. 11th lunar month of 1843: Kanô Minshi II took the name of Arashi Koroku V at the Kawarasakiza, performing in the drama "Osana Gunpô Jûroku Musashi"; his main stage partners were Bandô Hikosaburô IV, Seki Sanjûrô III, Nakamura Utaemon IV, Onoe Eizaburô III, Segawa Kikusaburô III and Nakamura Shibajûrô. 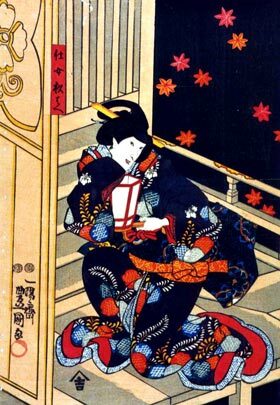 9th lunar month of 1852: the play "Sesshû Gappô-ga-Tsuji" was staged for the first time in Edo, at the Ichimuraza; Koroku played the role of Gappô's wife Otoku [casting]. 1st lunar month of 1854: Koroku's rank in the Edo hyôbanki, wakaonnagata section, was one black stroke above jô-jô-(shiro)kichi [visual]. 7th lunar month of 1857: premiere at the Nakamuraza of Sakurada Jisuke III's drama "Sanzesô Nishiki Bunshô"; Koroku played the role of Seibê's wife Okaji [casting]. 7th lunar month of 1858: Koroku appeared on stage for the last time, in Edo at the Nakamuraza, where he played the roles of Fuji-no-Kata and Oyoshi in the dramas "Ichi-no-Tani Futaba Gunki" and "Ise Ondo Koi no Netaba"
8th lunar month of 1858: Koroku died in Edo. Arashi Koroku V was the last heir of a great line of Kamigata actors. He unfortunately did not reach the same level of popularity as his grandfather Arashi Koroku I or his father Arashi Koroku III. He did not become a star but was very good in the roles of toshima in the latter years of his career, which he spent in the city of Edo. The 29th day of the 3rd lunar month of the 8th year of the Kansei era was the 6th of May 1796 in the western calendar. The 4th day of the 2nd lunar month of the 13th year of the Kansei era was the 18th of March 1801 in the western calendar. The following day was the last day of the Kansei era. The 15th day of the 11th lunar month of the 9th year of the Bunsei era was the 13th of December 1826 in the western calendar.